Feels Like Fall (ing) into Winter……. Monday….Oct. 31, 2011…..When the weather decided it was time to be cool it came with a vengeance. Had two days Friday and Saturday that were about as raw as you could ask for and still manage to catch a few fish. 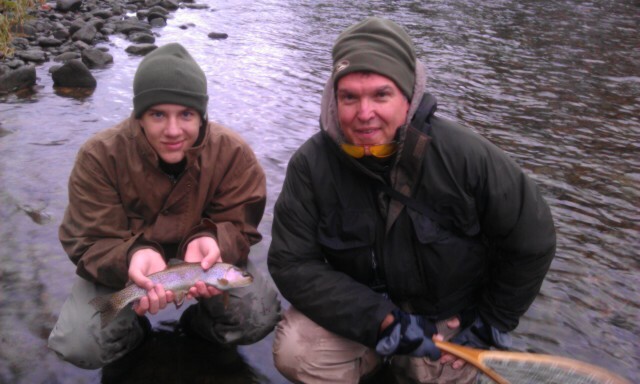 Ron Davis and his son Robert were troopers about it for sure, as casting in constant rain, wind, and 20-30mph winds is no fun no matter how much fun this flyfishing thing is. But the guys stuck it out, and in the end were rewarded with some fish…pretty impressive too, as we didn’t see other folks catching much of anything. I felt fortunate, and at the end of the day on Friday we ended with 3 really nice fish…redemption for having braved such nasty conditions. The chill in the air is great, I am looking forward to winter fishing. Not only because I love fishing in the snow, but we also tend to catch our largest fish in cold weather…so Bring it on! I have been busily stocking the boxes with flies, I cranked out a bunch yesterday and last night and hope to fill more holes this evening and in the morning. 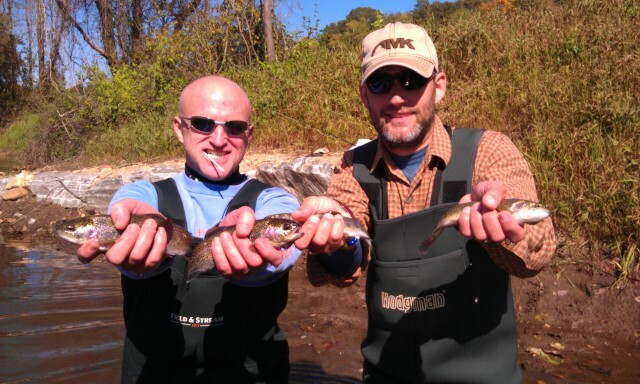 Then its down for a day or so as I am having another back procedure….what fun..
Ron & Robert Davis on the South Holston…..a cold day! Tough Weather and Challenging Fishing….. Sat. Oct .29, 2011…guiding Ron and Robert Davis, its been a challenging day with cold rain/snow mix, and very windy, some rising fish but its been really tough. Only a couple fish thus far, all other folks on the river near us not doing anything. Taking a lunch break and heading out again. More to come…. Cold and Wet in East Tennessee.. Sat. Oct. 29,2011…..Cold and wet here in East TN, we had a lot of rough, nasty weather yesterday. 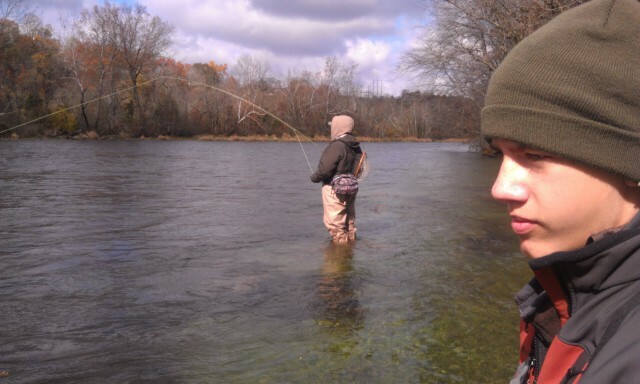 Fished in rain almost the whole day, temps in the high 30s, and windy too…..sounds wonderful! We found a lot of rising fish but it was very tough. Guided Ron and Robert Davis. It was Robert’s first trip, what a way to get initiated. We caught probably 20 fish and some really good ones. Almost all our fish on midges and the odd sulphur or two. The fish were tough, a bit unusual for this kind of weather. We had blue winged olives, midges, and a sulphur flurry or two. Sitting at the table tying some blue winged olive patterns this morning, sipping some fine coffee, and listening to the light rain/snow mix peppering the roof of the house here on the banks of the Watauga River here in Elizabethton, TN. Finishing up and then we are heading out to fish this morning. Lots like the same conditions as yesterday only colder. Hoooooo rah…..
What a Cold and Soggy Day…..
Fri…Oct . 28, 2011……What a soggy, cold, mess….rain, wind, and high 30sF. Guided Ron Davis and his son Robert. Rough conditons but the guys stuck it out and we got some really nice fish at the end. Sulphurs and bwos were hatching, lots of rising fish but tough fishing. Friday….Oct. 28,2011……Headed to the water guiding Ron and Robert Davis today on the South Holston…its raining. It’s a good steady soaking rain that will do a lot of good for the water table. This will make for excellent conditions over the next several days. I have a lit of guide trips scheduled so will have a ton of reports. I am fully expecting a hodgepodge of hatches today….blackflies and midges early to start, then Blue winged olives, then sulphurs, then back to blue wings before things wind down. We will see how close I call this one. Some more snow in the forecast, Banner Elk, Boone, Beech Mountain are expected to get a dusting to an inch or two. Can’t wait to see it. Stay tuned more to come, hopefully we will have caught a large fish or two by this afternoon. Thursday….Oct. 27, 2011……hey Everyone, got a ton of interest in the Fall Fly Assortment Special. When I emailed the link, some folks found it to be working and some not. My apologies for that, that is what I get for sending an email standing in the edge of a trout stream…..! But in any case, here’s the link below, it takes you right to my webstore where it can be purchased quickly, easily, and securely. These are really for shipment and shipping is FREE. Each Assortment contains (2) flies, 6 different patterns, a total of $18.00 per dozen. The six patterns included are CDC Glass Head Golden Nugget, Glass Head Skinny Nelson Nymph, Glass Bead CDC Zebra, Glass Head Blue Ice Nymph, Glass Head Zebra Midge, Miracle Mini Egg…… a pack of Trout Cryptonite if you ask me…. We will be having a good many of these offers in the coming months of different patterns. I am rebuilding the fly portion of my site, which is both time consuming and tedious, but will provide an easy way to have access to my personal favorite flies. 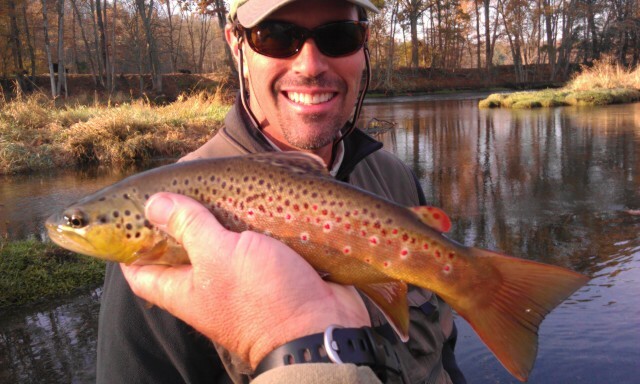 Why fish will any fly when you can fish with a guide fly? Have a great evening and tight lines…….! 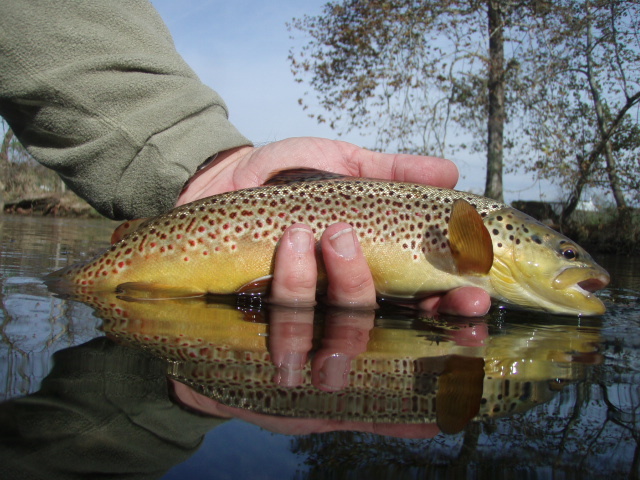 Wed. Oct. 26, 2011…..It has been a fun day guiding Bob Stanford, we are standing in the South Holston and dozens of browns are selectively feeding around us…it has been tough and very technical but Bob is a good caster and we cracked the code. Enough to catch about 15 nice fish. It’s satisfying to with no one else around us catching anything. 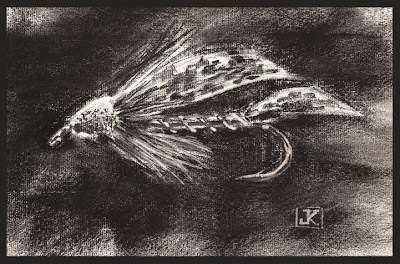 I have had several requests for the fly assortment special…if to go to our http://www.jeffwilkinsflyfishing.com site and to the fishing reports page there is a working link under yesterday’s report (10-25-2011) there that you can use to purchase. Wed. Oct.26,2011….man its early, we had to wake up the breakfast folks…guiding Bob Stanford, we are getting ready to get into the South Holston. There’s a 35F chill in the air…..I love fall here kind of feels like Wyoming. 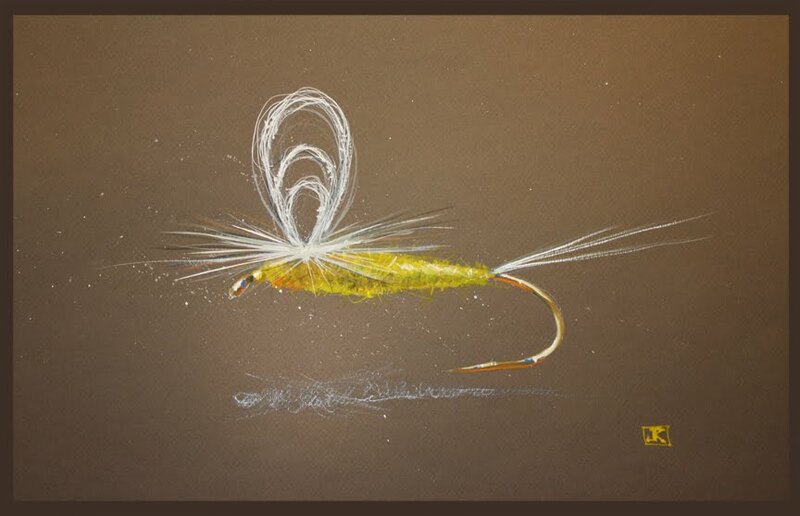 Had a link to a fly special I meant to send, my Fall Special which is an online or by email only. 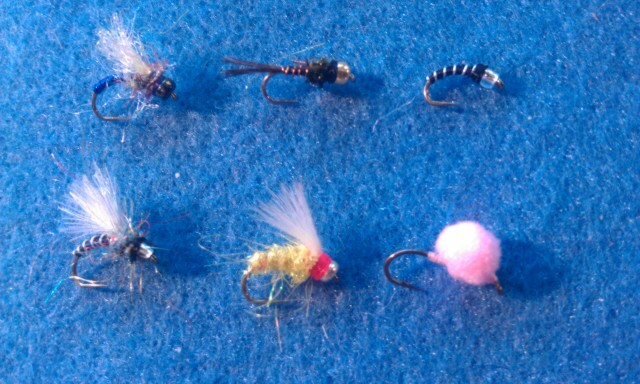 It’s my Fall Small fly assortment, 6 patterns, two of each, a total of 12 flies $18 plus tax and I will ship it for free. I have about 20 of these assortment and are offering them at the request of customers. Here’s the link…..
Stay tuned, some fishing action to come…..
Mon …..Oct. 24, 2011…….Had a great weekend and even our man Cam and the Panthers pulled one out. Looks like a good fishing week coming up…this weather is nothing short of incredible. Just like being out west. It’s chilly and frosty in the morning and by 10 or 11am you are pulling off the layers. Good morning Nymphing and on some waters dry fly fishing in the pm hours and all the way to dark. In any case its a good bit of all day catching. Had a 100 fish day on Sat guiding Chris Ramseur and Rob Fountain. Their wives had collaborated on putting together a trip for Christmas last year….they had a day of fishing they will never forget. Several things of note, we have a new newsletter coming. I am busily working on it. Also, I am sending out an email for a Fly special that will only be available initially to the recipients of this email fishing report. I have a limited number of fly selections available for sale that are an assortment of the small fall flies I have been using the past few weeks. They have been really hot for me….here is your chance to sample a few and put some in your own box. Will be sending this offer out in a few hours….. 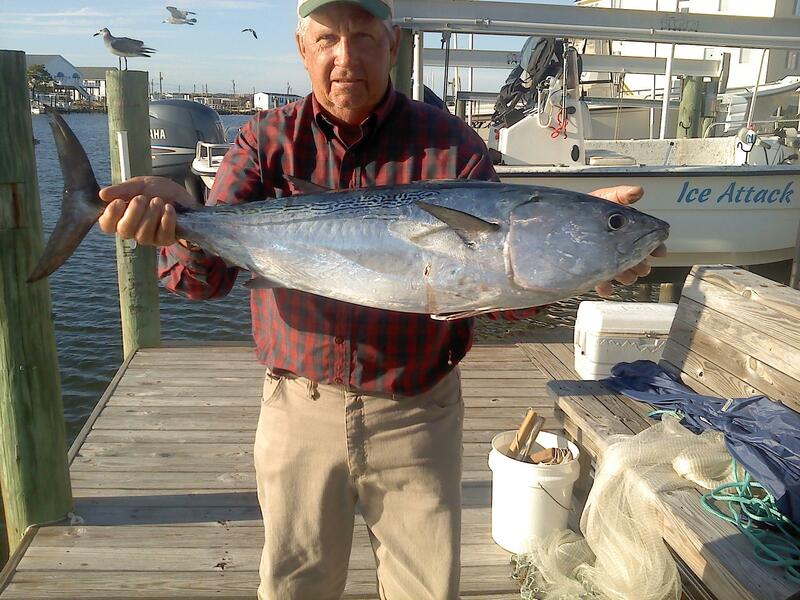 Incredible Day to Be On the Water…..
Sat… Oct. 22,2011…..What was an unbelievable day remained so in terms of the fishing and the weather. I was guiding Chris Ramseur and Rob Fountain and we fished three different waters and had a knock out day nymph fishing. The water was 50F and the fish were eating like gangbusters. We broke for lunch about 2:00pm and I honestly swear the guys caught just south of 75-80 fish. We took a lunch break and then headed on to some different water and it was much the same. About 15-20 more or so, a mix of browns and rainbows, and we stopped somewhere around 100. We didn’t catch any huge ones today but numbers were incredible. We caught fish on a variety of egg patterns and one of my new creations the Glass Bead CDC Zebra….rainbows simply can’t leave it alone or let it drift by untouched. I got tired of netting fish…. Have a ton of incredible photos I am posting to the site rift now and they are some great fishing pics plus some of the most gorgeous fall river photos I have ever taken. The color is out of this world this year.